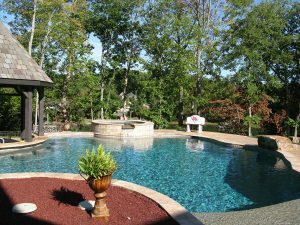 Carolina Custom Pools is one of the most trusted custom pool builders in Charlotte, NC and the surrounding area, specializing in designing and building the backyard oasis of your dreams. Whether you’re looking for a private backyard cabana, an outdoor kitchen, hardscapes, landscapes, special features, or are looking for a custom concrete pool, Carolina Custom Pools has the expertise to realize your vision for your perfect backyard retreat. Get a more naturalistic pool look with the sweeping arc design of a freeform pool to add to your backyard. Have the look of a freeform pool with the support of retaining walls for yards with changing topography. Class pools never go out of style. Add a timeless pool design to your backyard built by the experts. Turn your backyard into your relaxing outdoor living space with an outdoor kitchen, cabana, or fireplace. Take your pool to the next level by installing special features like custom diving rocks, waterfalls, or deck jets. Our experience with Andy of Carolina Custom Pools was better than we could have dreamed! What Makes Us Expert Custom Pool Builders? At Carolina Custom Pools, we recognize that project management is the most crucial area of any custom pool project, and successful completion requires expertise and attention to detail. Many custom pool builders in the area consider project management to be an entry-level job, meaning experience and know-how is sacrificed in favor of profits. However, we know the value of having a fully qualified, highly competent, accomplished manager on the job to coordinate our efforts for the best results every time. Our owner has over four decades of pool construction experience, and he oversees all of our projects from start to finish. Along with our attention to project oversight, we at Carolina Custom Pools have chosen to remain a small, streamlined company. This allows us to keep your project affordable through responsive communication and fewer redundant management layers. Choose Carolina Custom Pools to be your lean, mean, low-cost pool-building machine! Carolina Custom Pools is at the top of Charlotte, NC’s most trusted custom pool builders. We also serve York County, SC; Harrisburg, NC; Union County, NC; Rock Hill, NC; Gastonia, NC; and Shelby, NC.